Modern motorcycles are truly amazing, developed on computers and amazingly fast, right out of the box. A modern 600cc sportbike rolled straight off the showroom floor can achieve speeds and lean angles only dreamed of by vintage racers. Bikes like this Yamaha TD1B-C could be just as dangerous to the rider as to the competition. In days gone by, you could barely even count on your frame to stay the correct shape or the engine internals to remain internal for very long, and it’s pretty clear that it took a special kind of lunatic to race these sometimes unpredictable machines over the roadcourses of the day. 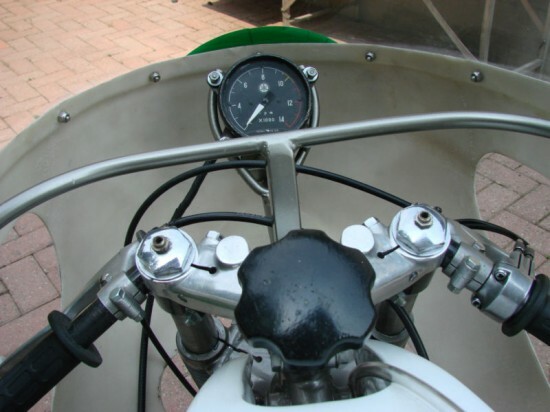 The TD1 was launched in 1962 and was developed through several generations until the factory released the TD2 in 1969. 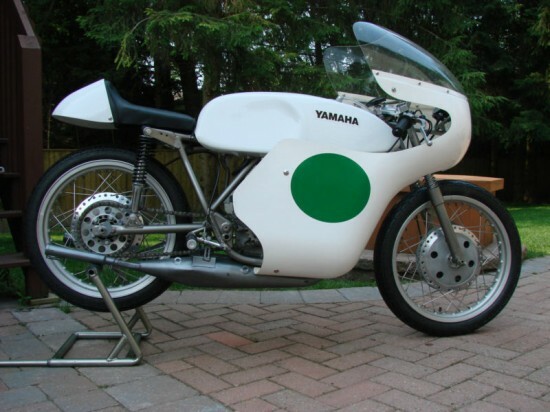 This Yamaha TD1B/C represents a midpoint in the development of this racing machine and includes parts from several generations: it’s a machine that feature’s a racers practical mentality, incorporating parts from several generations. 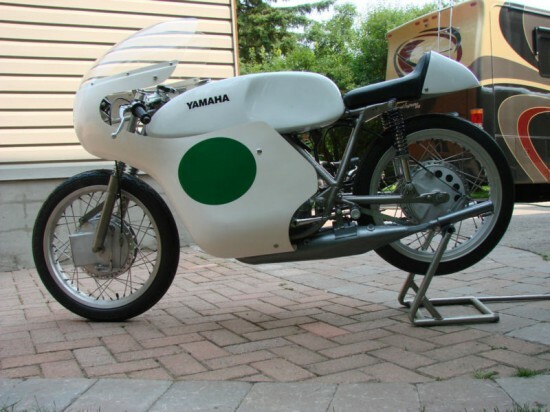 From the original eBay listing: 1967 Yamaha TD1B-C Race Bike for Sale! There was no doubt that Yamaha got a few things wrong with its first production racers, the TD1-A and TD-1B. The ‘B’ went some way towards correcting these, with a larger 25mm crankshaft and a porous chrome plating applied to the cylinder bores to retain oil and increase engine life. With changes to port timing, the engine now revved to 10,000 and gave better all-round performance, but there were still reliability problems. Engine mounts cracked, the clutch was still a very fragile affair and the chrome cylinder lining would flake off, snagging the rings. However the TD1-C, announced for the 1967 season, was represented a quantum leap in the vital missing ingredient – reliability. This example was restored by Canadian racer & restoration expert Dave Lloyd and then acquired by the current owner. Its an excellent example that has been on display in his collection for over a decade. Engine #TD1-C000113, frame #T1-334 shows this as a B chassis with a C motor and front end. As is mentioned in the eBay listing, clutches were notoriously fragile and the upgrade is an excellent idea: they could fail spectacularly, actually fracturing the cases! 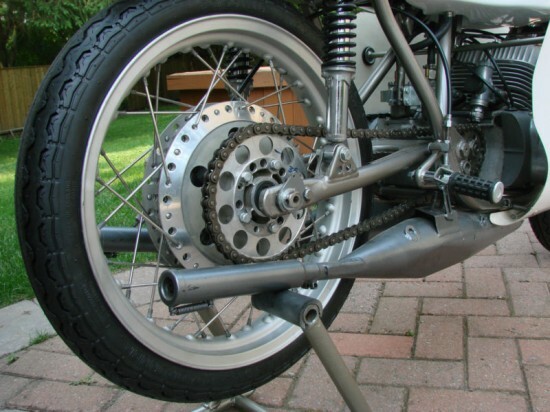 Gearing was also odd, with an ultra-low first gear that aided jackrabbit starts, but was nearly useless once underway. It probably didn’t help with clutch longevity, either. 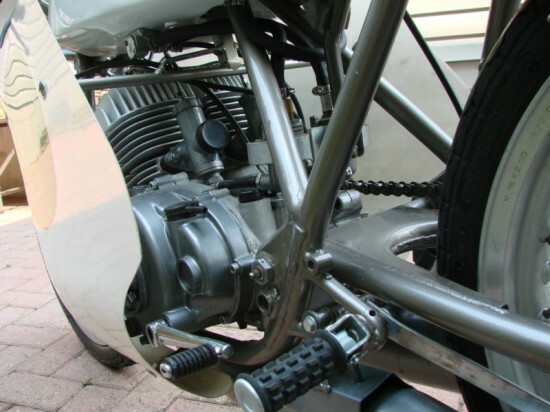 But, in spite of their dubious durability, the bikes won races, and the progressively improved A, B, and C iterations remedied some, if not all of the issues that afflicted the TD1’s. Unfortunately, this one looks like it’s really best for collectors, not riders: it’s a bit too pretty to use for hard track duty, and it’s not clear from the ad if it even runs, since it’s listed as “having been on display.” There’s very little time left on this auction, so move quickly if this snarly little beast would fit into a vintage racebike-sized hole in your collection.